← After the Party … ? Home » Money » Keep it Going! The parties are over, and we got through the New Year and the Inaugural. Everyone in Washington is back at work and ready to make great things happen. Not so fast. A lot has happened since the start of 2009, a convenient time to look back over the economy for a lot of reasons. It was the start of Obama’s presidency, but more importantly it was when the financial collapse triggered by the fall of Lehman Brothers really hit the economy in general. It was the start of final phase of this Depression. So how are we doing? It’s worth looking back if for no other reason than to make a few predictions – or at least know what to look for in 2013. Let’s break it down. The graph below has 3 different things on it from January 2009. 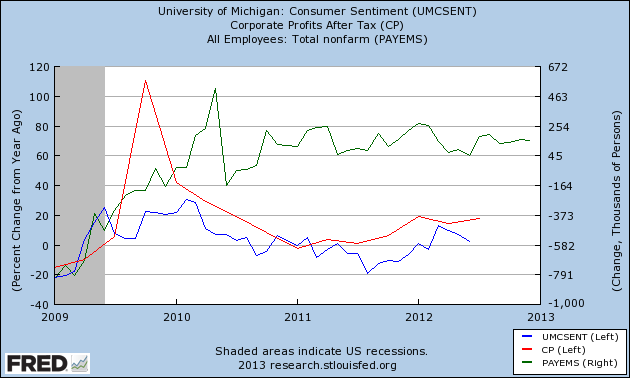 The blue line is the net change in consumer confidence, as measured by the University of Michigan Survey. The red line shows the net change in corporate profits, always a good measure of what we can expect on Walls Street. And the green line, on the right scale, is the gain of jobs in thousands. Let’s take each of these things to watch one category at a time. Jobs: We’re adding 1.7M jobs per year since the low in 2010. It’s not bad, but it’s not great. What we can expect in 2013, at least if the job growth is real, is a decline in youth unemployment along with the present trends continuing. Hiring more youth would be a strong signal that the market for experienced workers has tapped out and we are finally making our way towards the kind of growth in jobs that will get us out of the Depression. Consumer Confidence: It’s been up in 2012 for the first time since the last official recession, the highest it’s been in 5 years. It spiked as high as 80 (1966=100 by definition) and shows signs of general improvement. Those trends should continue through 2013, or at least not decline. A number above 50 suggests growth, and we should stay above that through the year if we are going to see improvement generally continue. Corporate Profits: Some will tell you this is a bad thing, but corporate profits usually rise before employment at large companies. They did rise in 2010, right before hiring started to pick up the next year. They haven’t risen much since. We won’t see a strong rise in employment until they do, like it or not. Real Estate: 2012 was the year that the “housing bubble” was finally put behind us – at least according to some real estate watchers. That has to continue through 2013 before we can call this the real end of the bubble, and they should. This is something to watch for through the year. So what should we expect in 2013? The job growth should continue, but look more to a decline in youth unemployment before you believe it’s a strong turnaround. Consumer confidence should stay around 80 through the year, and if anything should go up – but don’t expect a miracle. Corporate profits will have to rise before Wall Street will get out of the secular Bear Market, and that should happen this year. Lastly, real estate should continue solid gains. Think of these less as predictions and more as the signs that we need to be sure that the recovery is real. If one of the four doesn’t happen it will be a sign we’re still mostly treading water. Two or more of them fail and we could enter another official recession. That’s the call for 2013. Anything else we should watch for? This entry was posted in Money, Nooze and tagged 2013, consumer confidence, corporate profits, economy, Jobs, real estate, recover. Bookmark the permalink. A handy guide, thank you. Will we see more on youth unemployment from you this year then? That is a big problem. Thanks. Yes, I will be watching that, but only report if I see a change. It’s a pretty obscure stat that isn’t reported widely. The graph doesn’t show much, you could have found a better one. Corporate profits are important and that has been fueling the rise in stocks lately. That will boost confidence even more and it should encourage more hiring so this all makes sense. The real estate component is stranger but I guess we have exhausted the foreclosed properties after about 5 years since the bubble really burst. I was surprised that you didn’t even mention the things that could seriously derail the recovery such as a bad deal in Washington or a major event in Europe. We can’t discount any of that yet and many bond traders believe this is the year the market will go bad. I will look for better graphical data – it’s been hard to find a good way to represent the (slow) progress. Corporate profits are essential, and yes, it will boost just about everything. Keep in mind that in a traditional recovery we see that rise first – not last, as we are now. But seeing profits return could show that we are entering a real “recovery”, and I hope that accelerates job growth. Real estate boggles me completely. 🙂 I’ll leave that up to the experts, but try to filter the enthusiasm as I can. It is improving, and in 2012 we definitely saw a rise off the bottom. I can’t believe there won’t be a bump in the road somewhere. This is probably the year for it I think. Europe has to screw things up for everyone yet the way they act. That would be the most likely place at this point, yes. Japan is a mess but no one seems to care. China could enter a real recession, but I have no idea what that would mean. And, of course, the momentum in Washington may stall. There are a lot of potential “bumps”. This analysis of impacts of the Great Depression on the long-term growth potential of the advanced economies highlights the following points. First, the impact of weak bank balance sheets and increased risk aversion on the part of lenders in the wake of the Depression was mainly felt by smaller, younger firms. But with large firms enjoying access to other sources of funding and retained earnings growing reasonably strongly after 1933, it is hard to conclude that this had a first-order impact on capital spending or output growth. Second, there is little evidence that increased public debt or policy uncertainty had major effects in depressing investment. Third, while there was extensive structural and long-term unemployment in the 1930s, this also declined relatively quickly once sustained recovery set in. Fourth, the crisis was also an opportunity, as firms used the downtime created by the Depression to reorganize and modernize their operations in ways that boosted productivity growth. But creating a policy environment where they had an incentive to do so required political compromise of a sort that can be difficult given the polarizing effects of financial crises. This time around, we are leading with smaller firms. I am looking to the time when bigger firms, buoyed by profits, start their share of the hiring. And I do think a lot of bigger companies are modernizing – and the small companies are startups that are new from scratch! One of the weird things about employment growth has been how steady the ADP numbers are, IMHO. About 140k per month, give or take just a little. That really should accelerate at some point – but it hasn’t yet. “In the 1920s DuPont continued its emphasis on materials science, hiring Wallace Carothers to work on polymers in 1928. Carothers discovered neoprene, the first synthetic rubber; the first polyester superpolymer; and, in 1935, nylon. The discovery of Teflon followed a few years later. DuPont introduced phenothiazine as an insecticide in 1935. Throughout this period, the company continued to be a major producer of war supplies. As the inventor and manufacturer of nylon, DuPont helped produce the raw materials for parachutes, powder bags, and tires. Yes, we don’t have that kind of work going on now. The deficit in re-investment is very chilling, IMHO, and it’s more than just public infrastructure. World growth is expected to remain below trend at 3.1 per cent in 2012 and 3.4 per cent in 2013. The Euro Area is forecast to contract by 0.5 per cent this year and grow only marginally next year with unemployment reaching ‘depression-era’ rates in some periphery economies. The US is likely to grow by 2 per cent in each year. Growth in Brazil, Russia, India and China will be below long-term potential next year, although ‘hard-landings’ will be avoided; the impact on advanced economies will be offset by a large gain in competitiveness. Debt to GDP ratios in OECD countries will, on average, be higher in 2014 than at present. I’ve seen this. I believe that we will grow faster than projected, largely because I believe that Europe will have less influence on our economy than most fear. Exports to Europe will drop somewhat, but the “periphery” is far less tied to us than the much stronger UK/Germany/France – which will not fare quite as badly. I also think that our trade with Latin America will more than make up whatever we lose, and that our oil imports will continue to decline. I agree that Europe is a very sad story, and I do wish them all the success possible. But I can’t see them getting out of this through austerity – we certainly didn’t. They have to find a way to encourage growth in whatever system they develop. The big issue world-wide remains debt. I could see one or more major global investment banks failing in the next two years, but I’m pretty sure it won’t mean a damned thing or have anywhere near the ripple effect anyone expects. I would still love to see a “Jubilee”. Do you have a link? Who is this from & how accurate are they? Here’s a link, but the whole article is unvailable. Only the abstract was there, but I’ll look for the article in other sites. Thanks. The Economist poll of forecasts isn’t a ton different in their outlook – which is not good. It is worth repeating and repeating: Europe is pursuing an incorrect policy. Even as a conservative, I believe Lord Keynes is correct, as applied to Europe’s current situation. It makes me want to cry, to think they have to keep repeating mistakes. I also realize Angela Merkel is astute and perhaps Germany can lead in a different direction. Agreed. Of course, it’s often a matter of what you’re buying with the stimulus. The infrastructure deficit is an obvious place to start putting people to work. I often think about more modern budgeting where capital and expenses are separated. Would love to know what you think. I could see a requirement that the expense side is balanced, which is what Minnesota and (I think) most if not all states have.